Grease bottom and sides of 13x9-inch (3-quart) glass baking dish with butter. In large bowl, beat flour, milk, 1/4 cup sugar, the vanilla, salt and eggs with wire whisk until smooth. Stir in bread and 1 1/2 cups berries. Spoon into baking dish. Cover tightly and refrigerate at least 1 hour but no longer than 24 hours. Heat oven to 400°F. Uncover bread mixture. Bake 25 to 35 minutes or until golden brown and knife inserted in center comes out clean. Meanwhile, in 1 1/2-quart saucepan, stir together 1/2 cup sugar and the cornstarch. Stir in orange juice until smooth. Stir in 1 cup berries; heat to boiling over medium heat, stirring constantly. Cook about 4 minutes, stirring constantly, until slightly thickened; remove from heat. Just before serving, stir in strawberry halves. 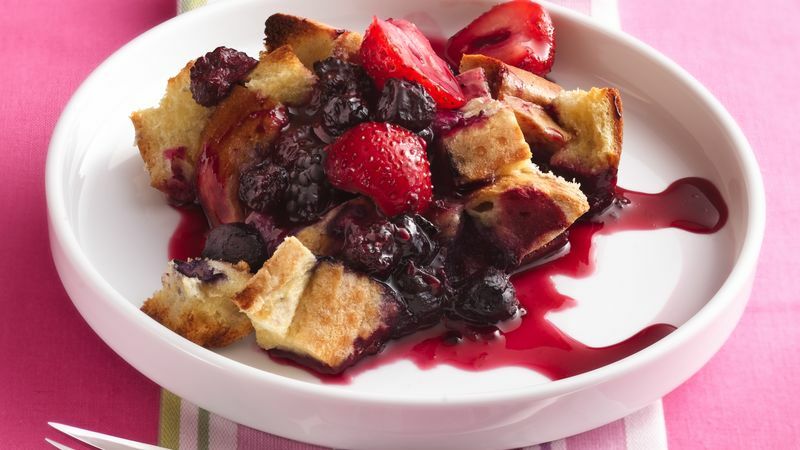 Serve warm over French toast bake.